You hear it right and left these days, choice gives students motivation in their reading. It makes sense, really. Who doesn't want to pick out their own book? When I go to the library, I love walking down the aisles, grabbing colorful books whose covers pull my attention or books by authors my friends have recommended. Our students want the same thing. That's why literature circles can be such a great idea. You provide your kiddos with a variety of books to choose from, get them into groups based on their choices, and let the magic happen. Except... the magic doesn't always happen. Literature circles aren't the easiest to get right. My first year as a teacher, I knew I didn't have time to fit both The Sun Also Rises and The Great Gatsby into my year, full as it was on either side with all my curriculum experiments - poetry slams, play performances, Transcendental village projects, and creative writing festivals. I knew I could just pick one, but my heart broke a little at the thought of abandoning either Hemingway or Fitzgerald. Who could split up such close friends? So I pitched both books to my students and let them pick the one they wanted to read. We ended up split about half and half. I had them assign the reading to themselves over the days we would spend on literature circles, and then I introduced them to the traditional literature circles roles (similar to these). They each had a role to prepare for and then present each day, and I collected those role prep sheets to give them credit for their work throughout the unit. I liked that it pushed them to be independent with their discussions, but I didn't like not being able to rescue both groups at once if they were really struggling. I liked the concept of the roles, but I didn't like how the prep felt like busywork. I liked the good work the groups did together, but I felt like it got a little repetitive meeting day after day to do the same general thing. 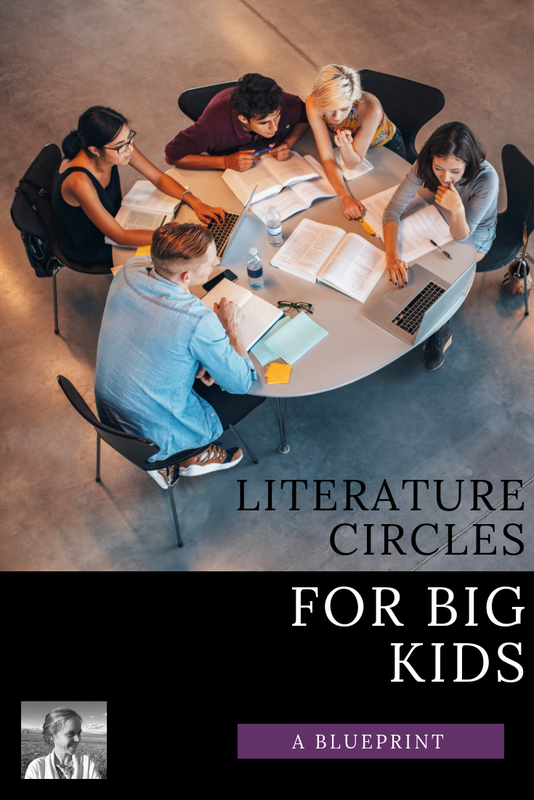 Earlier this year I asked the amazing teachers in my Facebook Group, Creative High School English, for their best tips on using literature circles well. Crickets. Soon someone chimed in to say that no one was responding because literature circles just don't work. Well, you know me, I love a challenge. So this winter I have been designing a new literature circles concept. I call it, literature circles for big kids. Opening your literature circles unit with a book tasting will allow your students to "sample" each book and find out if they like it. It's a simple activity, but requires a bit of muscle. Pull your seating together into little cafe-style tables and, if possible, throw some tablecloths over them. Set the mood as much as you can with vases of flowers, a little background music, maybe some snacks. (Check out some photos for inspiration in this fun article over on We Are Teachers). Then spread your literature circles book choices out over the tables. Have students move from table to table, previewing the books and jotting down their reactions on a piece of paper (some kind of a menu or book review handout that you create). By the end, they should have a clear favorite or two. At this point, you can have them turn in a list of their top three choices, or you can try to sort things out in person by having them move to different parts of the room representing different books. If you've got enough books for everyone in their first choice group, then you can skip the step of collecting preferences and assigning books. If you don't, you can ask people to try to shuffle a bit in new directions (pitch hard for the book that's getting no love!) or just move right into collecting preferences. Assign the books and move forward from there. This is a key adjustment with this literature circles for big kids program. It's HARD to keep the momentum going for independent group meetings if you slowly wade through the books a chapter at a time. 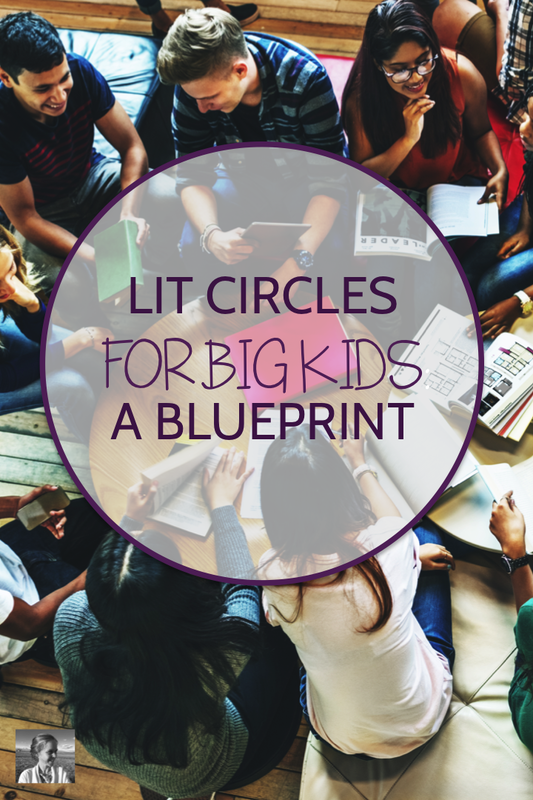 So instead, embed your literature circles work inside some other unit, so you can spread out their group meetings (and they can schedule their reading) over the course of about a month. Maybe you're working on real-world argument and vocabulary, or doing an ELA makerspace unit, or blogging, or trying out genius hour for the first time on the alternating days. 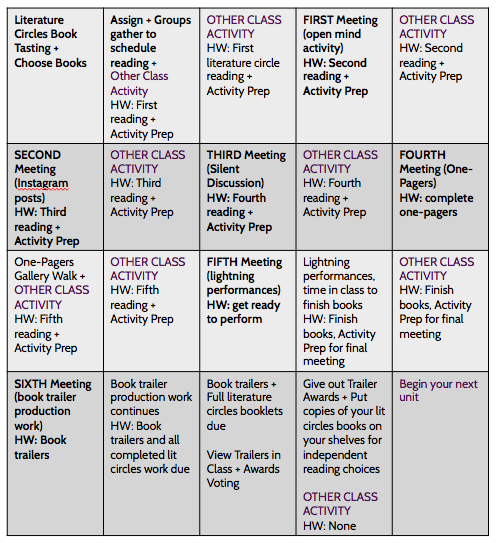 Just print up a basic schedule for the month for your students, and ask them to assign their own reading so they can finish the book in segments for your meetings. Here's an example calendar (below) to give you the idea. Alternatively, if your kids really struggle to complete reading outside of class, you can alternate meeting days with reading days. Now here's another key switch. Instead of making each meeting the same, with every role offering a short presentation on the work they've brought in, followed by a discussion that will only be as good as the enthusiasm each group member brings to it, make each day a different activity, as you might with a whole class novel. Tons of different types of activities would work, but the ones I brainstormed for this unit are: silent discussions, open mind character analysis activities, book-themed Instagram posts, one-pagers, lightning theater versions, and making video book trailers. For each activity, you can assign a short homework that goes with the reading and helps them prepare for that particular type of activity. So before a silent discussion, you might have them brainstorming discussion questions and circling their favorite. Before a lightning theater version activity, you might have them create timelines of five key moments in the reading so far. With everyone doing similar activities, you'll be able to let groups share out at the end of the period or even do full gallery walks or performances in the next period if you want to. Students will be interacting with allll the books being read and hopefully getting interested in other titles. To finish your literature circles unit effectively, have students do a final project that leads to a shareable product - like Youtube-style book trailer videos or a Literary Food Truck Project (click here to visit a post all about literary food trucks and pick up a free curriculum set). Make the finale of your unit the enjoyment of this final product in a special class event, and let students vote on their favorites so you can give out awards. This way, every student is exposed to the themes and ideas of every book. Then your next move can be to set up all your literature circles books in your independent reading library, so everyone can branch out and try more from your set as part of your choice reading curriculum (don't have one yet? Sign up for the 5 Day Choice Reading Challenge here!). 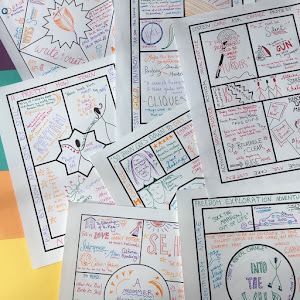 Hopefully you're feeling ready to design the Literature Circles unit of your dreams. 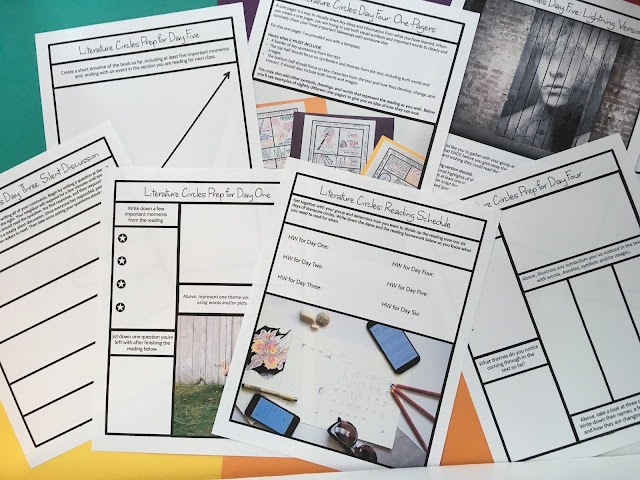 Empower your students with choice, but keep things from dragging and give them lots of creative ways to interact with their reading with this fun blueprint. If you'd like a hand prepping your materials, you can find my new full curriculum for Literature Circles for any Booklist right here on TPT. What are your thoughts about adding in comprehension quizzes at the different due dates for their reading? That way there is an objective assessment as well? Also, do you ever wrap your weeks around common themes? Thanks! I really appreciate your insight on that! That makes a LOT of sense. I guess the reason I am interested in doing the quizzes is because they are quick and all "them". I don't do much in the way of homework, other than reading and papers, because there is no guarantee it's all their understanding. If you are doing assessments in class, what do those look like?